This Christmas, dream big! See the potential. Sponsor Today! 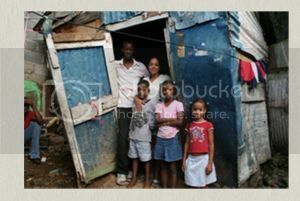 Betty lives with her sister, Belkis, her brother, Kelvin, and their parents near the outskirts of Santo Domingo in Los Mameyes. Their father used to work for the government as a city laborer. However, when the new president from an opposing party was elected, all government workers were replaced. Their father was left unemployed and wondering how he would be able to send his children to school. Yet, God provided. The COCREF school in Los Mameyes, known as Ramon Reynoso Christian School, offered tuition assistance for this family. Today, Betty and Belkis are excellent students, despite their extreme economic poverty. In fact, last year, Betty was recognized by the school for her excellence as a student. And, although Kelvin is unable to attend school, because he is deaf and mute, he and his two sisters can be seen in Sunday School every week at the church where the Ramon Reynoso School is located. In addition, their mother has also accepted Christ and is now a member of the church! The Lord uses many means to reach His children, and Ramon Reynoso Christian School, along with the church, has been one of them. At EduDeo Ministries, we believe transformation is for every child and by blessing the whole, each ONE may be impacted. Together with indigenous associations, we identify the most effective way to assist Christian schools and teachers in developing countries make a significant impact in the lives of individual children. This Christmas it is our prayer and hope that you will look a little deeper and see the potential that every child has when given the opportunity to receive a quality, Christ-centred education. Become a Sponsor today and allow more students reach their God-given potential! Be inspired - read more stories of transformation in the lives of children! Learn more about how we do "Sponsorship Differently"! We can all do something, we’ve all been called to a task. Watch the video “How Do You Transform a Life?” to be inspired about how each of us fit in God’s plan. LIMITED TIME OFFER: Sign up between Tuesday, December 3 and Tuesday, December 17 and we will send you Keith and Kristyn Getty's "Joy: An Irish Christmas" CD as our gift to you!